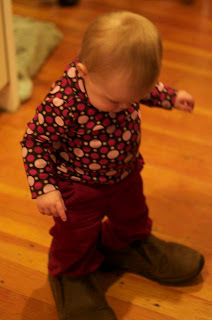 I believe that I've mentioned that Margot has a thing for shoes. 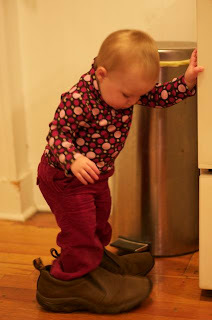 For a while now, she has been trying to put on any shoes she sees regardless of whether she is already wearing shoes or whether they are anywhere close to her size. This is probably a developmental milestone. 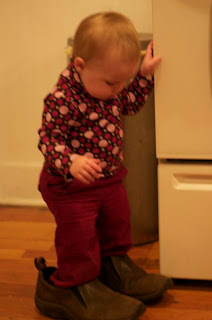 Margot successfully put on a pair of Adam's shoes (even on the right feet!) and walked all the way from the garbage can to the island (a good three feet) in them before becoming distracted by something shiny.